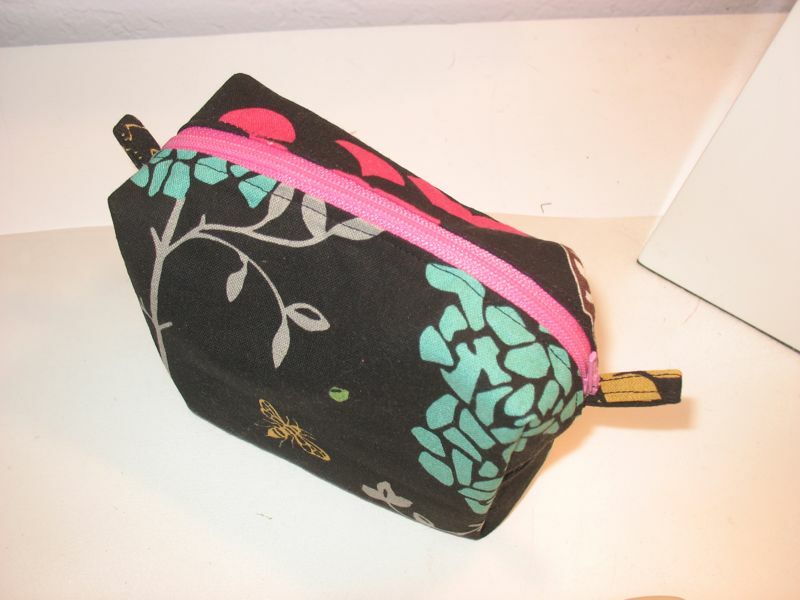 Small Boxy Bag Tutorial | OccasionalPiece--Quilt! Posted on January 4, 2011 by Elizabeth E.
Yeah–I changed the look of the blog again. I liked the clean, spareness of the other, but the giant-sized text was really bugging me. I hope the quilts look okay with this warm beigey background. We’ll see. You all know my whines about the last semester–how it beat the stuffing out of me. Yuck. So, there I was, at the end of the semester–Christmas and gifts and my brain was just flat out gone. So I postponed a gift exchange with my colleague and dear friend, Judy, as I had no ideas, nothing. You see–when I went back to Delaware to see my sister and her new husband–Judy took a week’s worth of classes for me, so I really wanted to say thank you with a hand-made gift, but I just couldn’t come up with anything. So my husband and I went up to Utah to see my parents and my husband’s family, and by the time I got home, my brain had rested and I knew what I wanted to make her. 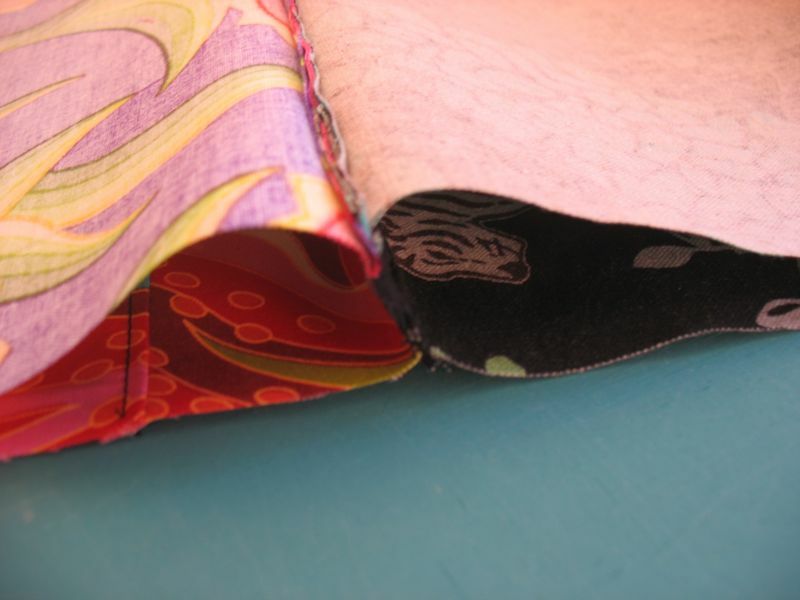 First, make pull tabs by folding a fabric strip lengthwise in half, then tucking in the raw edges; edgestitch. 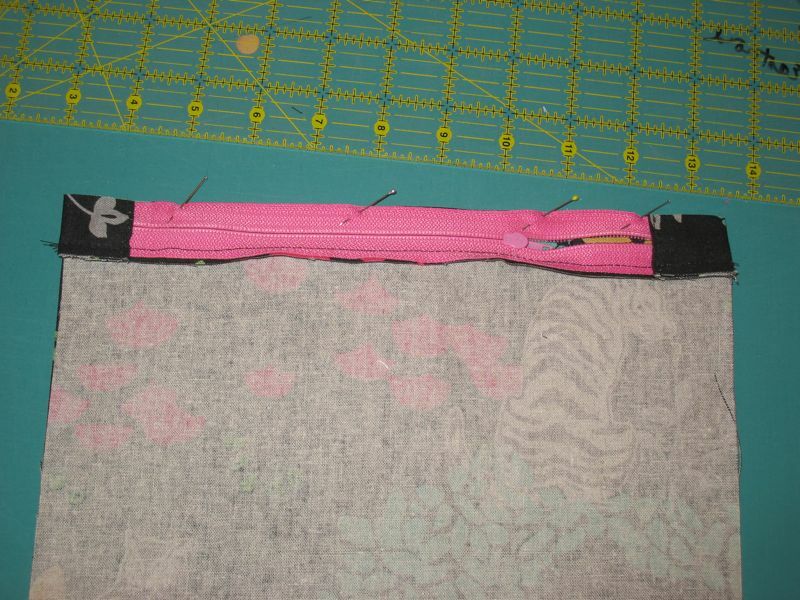 Cut to the desired length (about 2″), fold in half and using the info about adding a tab on a zipper from the Sister’s Choice tutorial, slip the tab in between the fabric piece and your zipper, as shown. 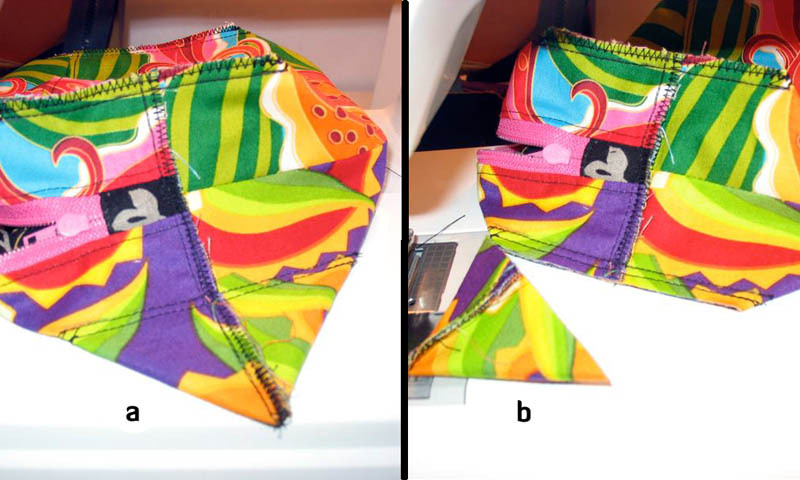 Lay the zipper face down and stitch along one edge (the one with pins). I’ve laid out rulers for you to see how large I cut my beginning rectangle. Believe me, it’s all guessing–all trial and error–so don’t fret about having it the perfect size. 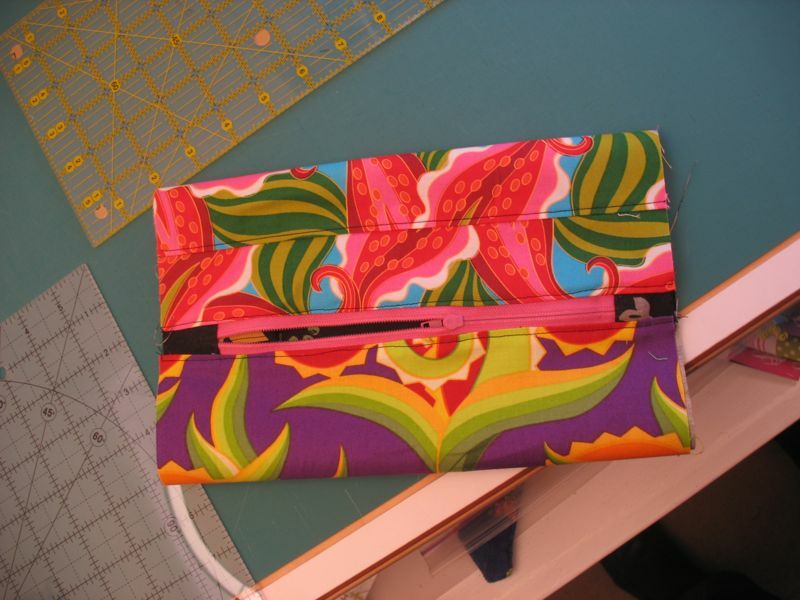 Press the fabric away from the zipper, then lay it face down on the other rectangle. 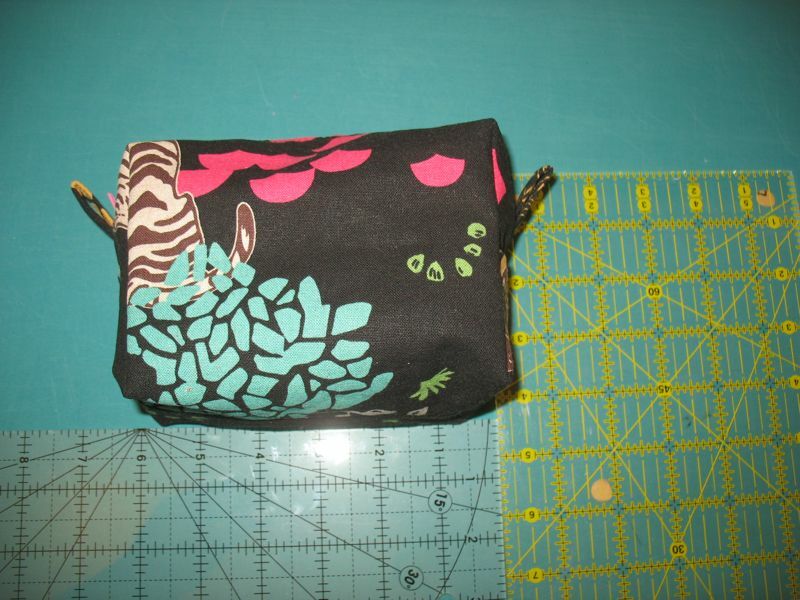 BTW, this is the bag I made for myself–of course, my friend’s was perfect. Stitch again along that long edge.Notice in the photo below how evenly I stitched (not). 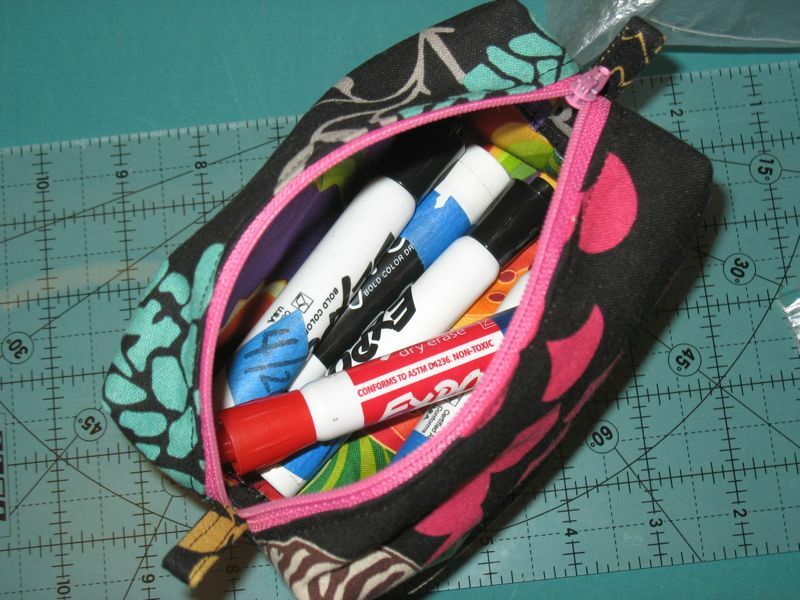 Just go over it again, if the zipper pull gets in the way–slide it down out of the way as you need to. 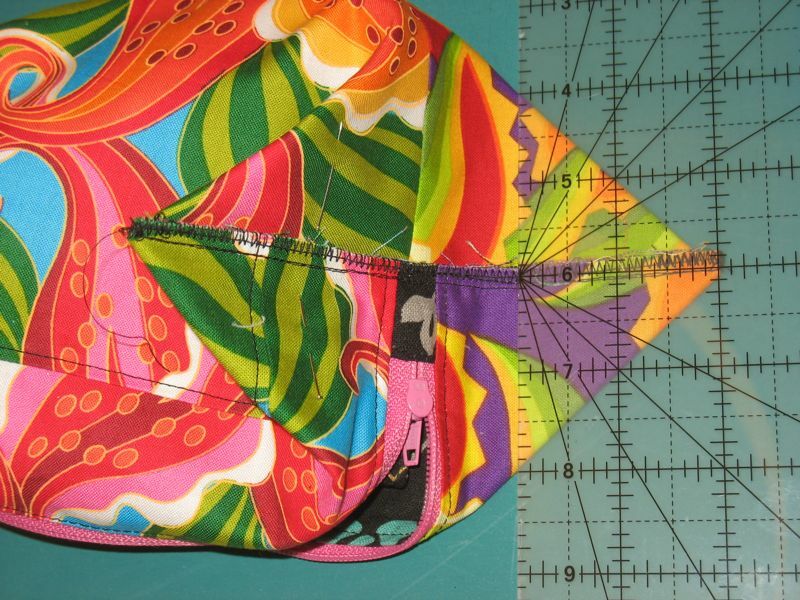 Lay the lining FACE DOWN, even with the top BACKSIDE of the zipper. Stitch. It feels all backwards, but it works. See–it works! Press it away from the zipper teeth, and do the other side. Once you’ve stitched the lining to both sides, and pressed it away from the zipper teeth, topstitch for a nice crisp look. If these steps are somewhat of a mystery, don’t hesitate to refer to the two posts I referenced earlier. 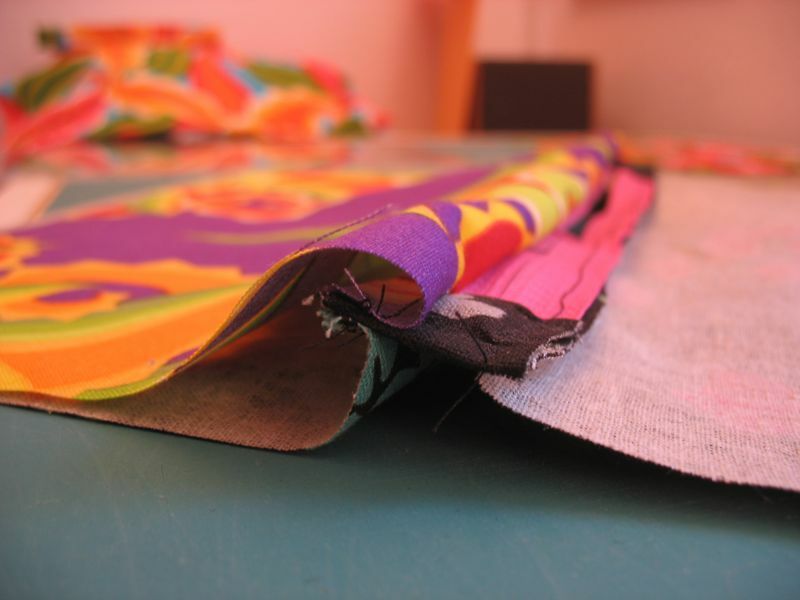 Separate the bag fabric side from the lining side–right sides together. 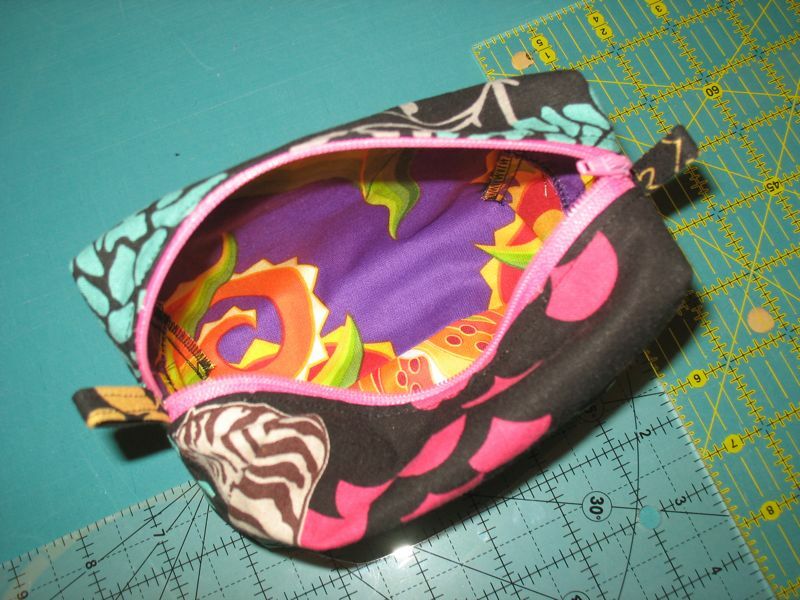 Stitch along the edge–where the bottom of the bag would be–on both parts in a 1/2″ seam. You’ll have two joined tubes. 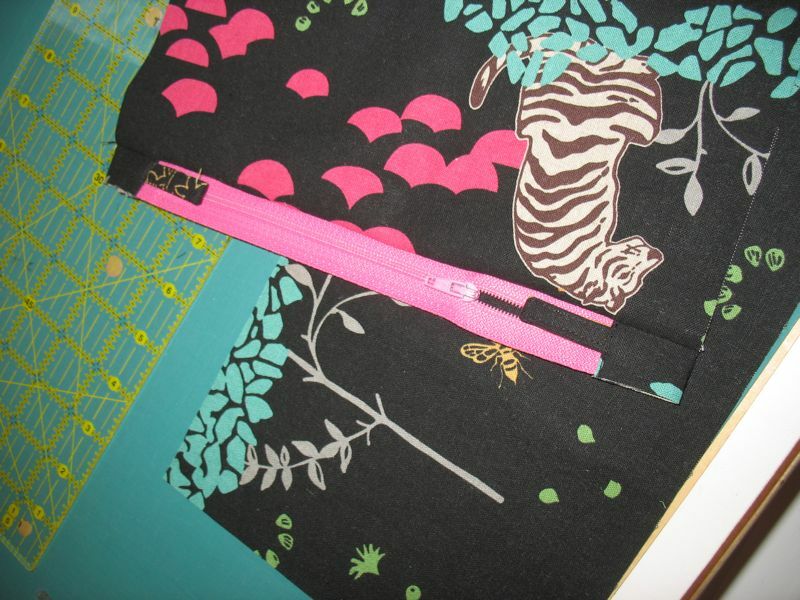 Flip the lining fabric back and around the bag fabric, enclosing it. 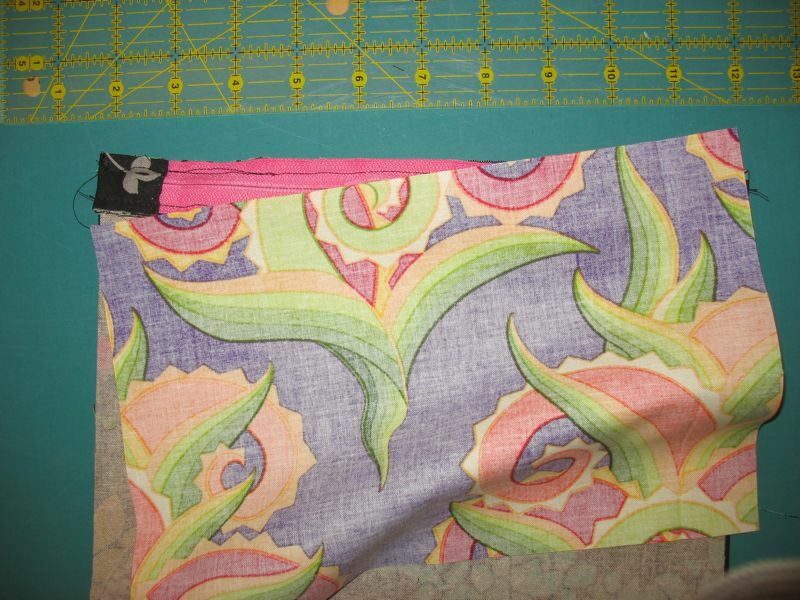 Line up the bottom seams; pin. Yours should look like this. 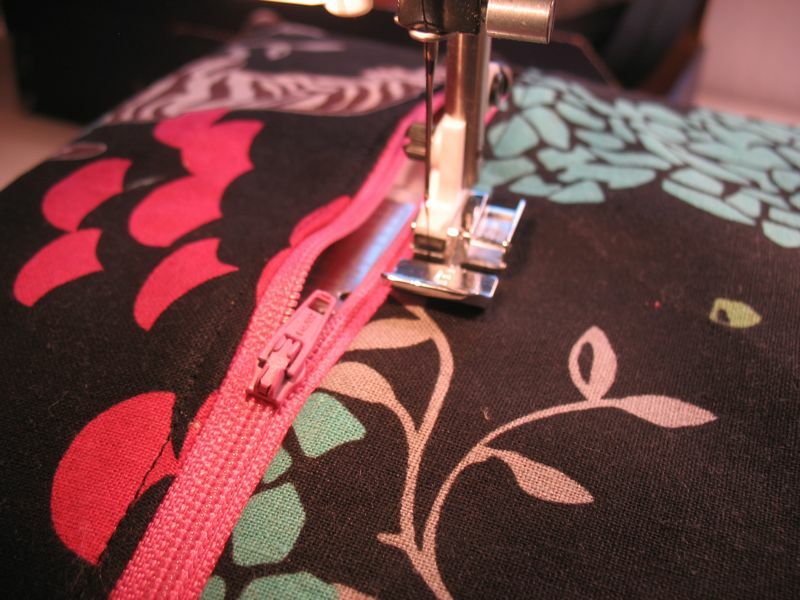 To save gallons of frustration later, make sure your zipper is only halfway zipped. 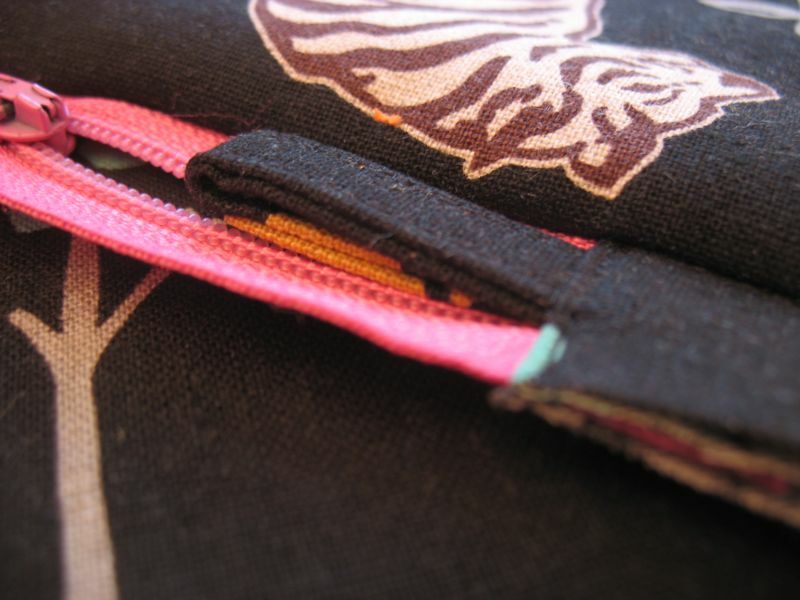 Line up the zipper seam with the bottom seams and pin. 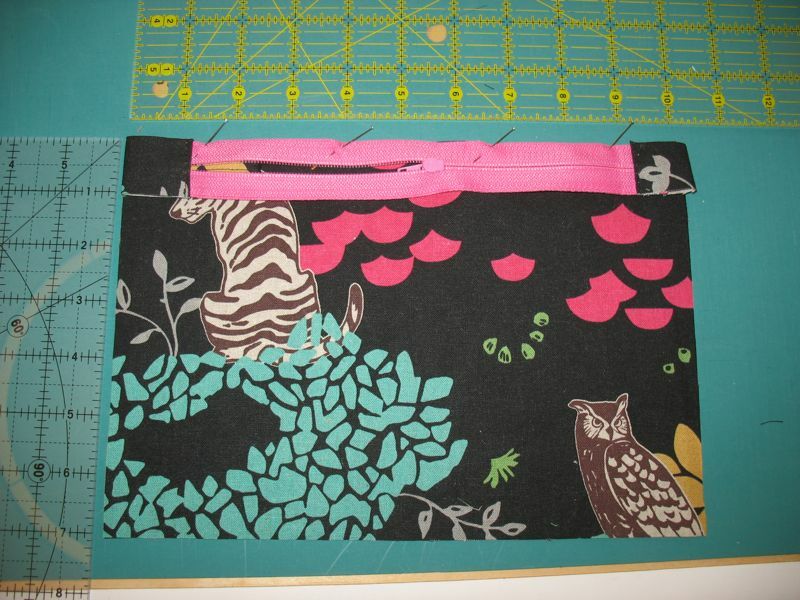 Stitch, then stitch again (a) , then trim (b) and zig-zag (c) the edges. Yes, I’m sure there’s a way so these internal seams are all hidden, but I couldn’t figure it out. Mangle Flatten the bag, lining up the corner as shown. Get it in the middle as much as possible, then lay your ruler as shown. The zig-zagged seam will be on the center line, forming a triangle–make sure the points of the triangle are equal distances from the zig-zagged seam (at the 4″ mark and the 8″ mark above). Draw a pencil line, then pin perpendicular to this line. Repeat this mess process on the other three corners. The first time you ever do this, you’re like “Huh?” but then you’ll get the hang of it. Promise. 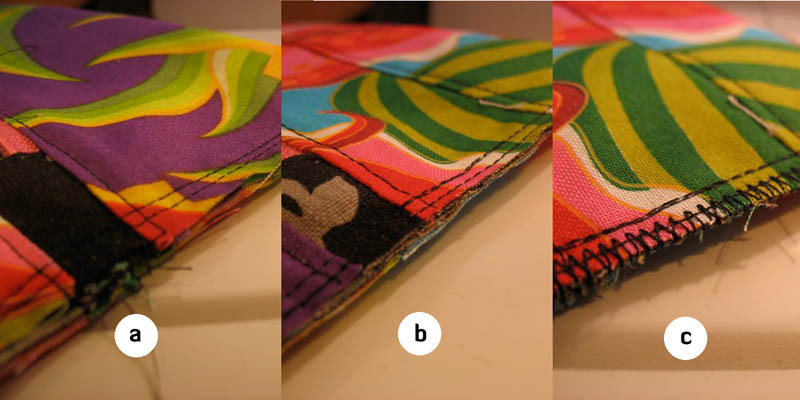 Stitch, stitch again (a), then trim (b) and zig-zag these seams as well (as shown by the chopped-off corner at the top). That’s it! You’re done! Turn it right-side out and admire. You can see my pull-tabs sticking out on either side of the bag. These are my markers in my bag–I bought my friend some new ones, and a new eraser as well. With white board dust, I recommend keeping the eraser in its own ziplock bag to further the time in between washes. Did you know you can wash your eraser? I do about every three weeks–soap and water does the trick, then an overnight dry. We adjuncts make NO money (practically) so we’re always conserving our resources. Here you can see the finished size: about 4″ by 6″. Very approximate. Have fun making these. I’d say the first one took me about an hour to figure out and stitch. The second one took me about 15 minutes. It goes faster and faster as you get better. An hour, wow, I’m still on the first few steps. Such a sewing whiz you are! Beautiful bag. I love love LOVE my boxy bag! Thank you!